The first bronzer I remember using was my mom’s Indian Earth. It came in a terra-cotta pot and was a fine powder that could be used as a bronzer, eye shadow, ect. My mom loved this stuff. I found it difficult to apply, maybe because as a teen in the 80’s we were a little heavy-handed with the blush brush. I was often left with something that was far from a natural tan. Luckily, bronzers have come a long way. There’s one brand that has the market cornered-Too Faced. They have probably 10 different types of bronzers that give a very natural sun-kissed look, but I prefer their “Bunny” line. Today I’m going to feature my top three, but I do urge you to check them out. There is the perfect bronzer for every skin type and they are all gorgeous! This combination of satin suntan and rich satin bronze is a silky, golden warmth combined with an under toned bronze that mimics a natural tan without looking like an Oompa Loompa. This is my go-to bronzer in the winter. A golden bronze, delicate pink, white, and fawn glimmer create a natural and skin-perfecting glow. The color combination (just swirl together with a brush) mimics a “just got back from vacation” tan that will leave everyone envious. 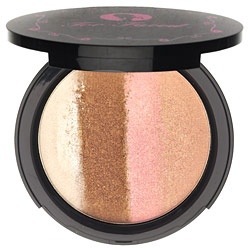 This compact features four (bronze, soft peach, golden ivory, and golden tan) illuminating shades of sun-kissed bronzers and shimmers that add the right amount of deep summertime tan. Everyone will think you are the ultimate “California Girl”. All are available at Sephora and Ulta. 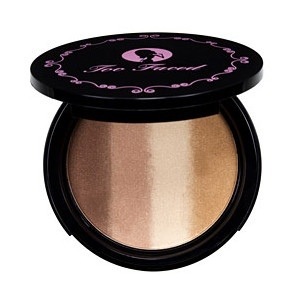 Too Faced also offers liquid bronzers and they have a fantastic cream-to-powder bronzer as well. If you’re looking for the perfect sun-drenched look. then Too Faced is the brand for you!